Easter dinner, heck the whole week of great food for company and once again so hard to choose one recipe so I won’t and just start with “steak night” and fill you in on Easter next time, rather low-key since we were downed by some evil bug for a couple of days. Good nights for grilling lately and with the seafood dinners behind us for the most part my special guests enjoyed this wonderful filet mignon dinner thanks to Adam Perry Lang’s BBQ 25 recipes. I have really loved every single one of his recipes despite the prep work, which after a few months is not so tough since I can make many of his sauces etc. ahead of time and even freeze many of them. Adaptable for me as I use some fresh and dried herbs depending on what is growing along the herb path, usually an insane amount of rosemary as it is quite prolific in our growing area. Most of you might not go to the trouble as the recipe may be too busy for you, but Michael (the non cook) is becoming quite the grill master and once again, I had one of the best steaks since forever, perfect char and perfect flavors, melt in your mouth goodness. Simply seasoned Yukon gold potatoes on the griddle along with thick slices of Vidalia onions two great sides for steaks. The steaks are marinated and basted with a wonderfully seasoned pepper relish to desired doneness and served with some reserved relish. Combine all the ingredients for the relish in a bowl and mix well; set aside. Can be made ahead. Marinade Combine all the marinade ingredients in a large bowl or a sealable plastic bag. Mix the ingredients with your hands, directly or through the bag, squeezing them to release the maximum flavor. 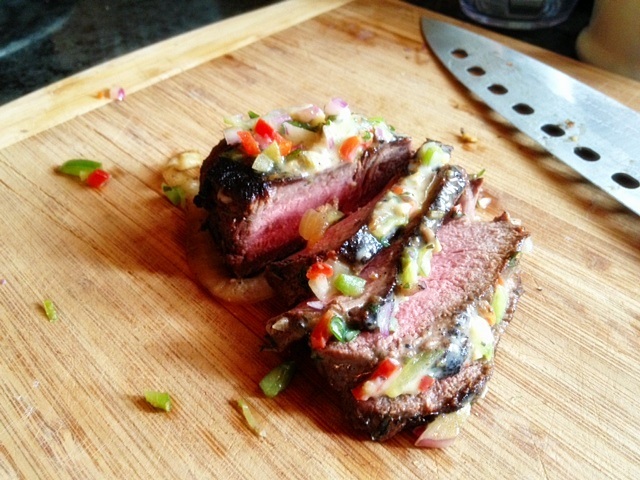 Put the steaks in the marinade and allow them to absorb the flavors for at least 1 hour and up to 24 hours. If marinating for longer than 3 hours, refrigerate the steaks. Drain the steaks and dry with paper towels. Generously season the steaks with salt and pepper. Press in the seasoning. Brush the steaks with canola oil. Combine half of the baste/relish mix in a foil pan or heatproof pan and set on the side of the grill. Put the meat on the well-oiled grill and cook until medium-rare (or cook to desired doneness). Move the steaks regularly back and forth between the grill and the relish/baste mix to moisturizer them and enhance caramelization. Combine the remainder of the baste/relish with the remaining ingredients and pour onto a serving platter and turn the steaks over in the relish as you place them onto the platter and spoon some of the mixture onto each one.